Attention, the aspiring candidates of Haryana Sarkari Naukri are brought in attention. Now you can receive the updates of Upcoming Govt Jobs in Haryana 2018 and Latest Govt Jobs in Haryana easily like never before. The services of jobs are dedicated for all those candidates who prepare themselves for the government jobs in Haryana. The good news for seeker of Government Jobs in Haryana for Fresher and Post Graduate is that their probability for selection has increased. Now the you can know jobs more jobs of the state as well Central Government Jobs in Haryana. The updates for all of these are given to you daily so that you don’t get late to apply. If not the profession you can also check latest recruitment such as Haryana Govt Jobs for ITI, 12th Pass, Diploma, Graduate, Engineer, etc. 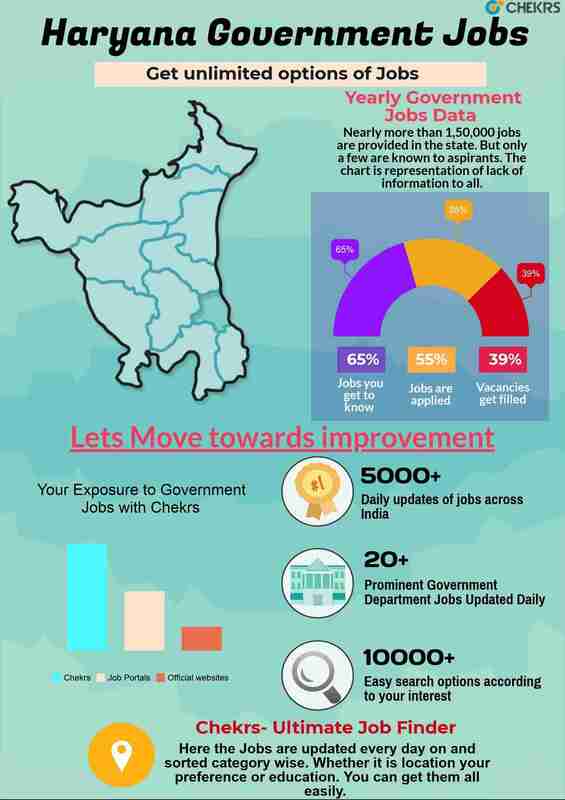 To know these Govt Jobs in Haryana immediately subscribe the services of jobs.chekrs.com and get the alerts every time a new vacancy is released. Why Chekrs for Haryana Govt Free Job Alert? This is just the right place where you can receive the updates of jobs which are available on no other portals. If you find the official notification lengthy enough than you can check Haryana Government Job 2018 details like application submission, important dates, eligibility criteria and selection process in summarized yet complete. In order to help you achieve your goal we help you provide all the resources that contribute in studies. Study material such as the syllabus, previous papers, sample paper, model paper can be referred for day to day practice. Also the free online mock tests and quiz you can be improved. In case of confusion you can take help of preparation tips.